Now is the time for all ye wizards and would-be wizards to grab your wands and don your pointy thinking caps for some spell-casting, deductive fun in Abracada…what? 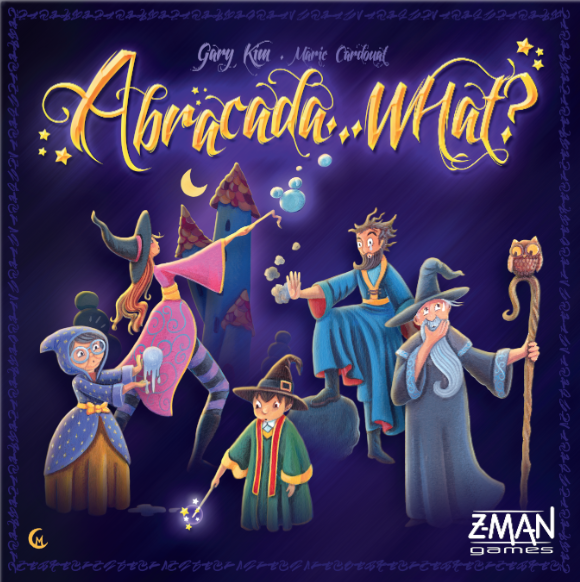 In this family-friendly game, you and your fellow wizards take turns casting spells on each other. It’s a strange contest. You all know the same eight spells, inscribed on ancient stones. There’s one number 1 spellstone that can summon the Ancient Dragon and release his fiery breath; roll a die to determine the damage done. Two number 2 stones call the Dark Wanderer to draw energy from others and restore your own. Three number 3 stones allow you to spin a Sweet Dream and restore your health; roll a die to determine how much. Four stones, each numbered 4, let you ask the Night Singer to reveal one of the four secret stones to you. Five spellstones call a number 5 Lightning Tempest to strike the magicians to your left and right with one damage. Six will bring a number 6 Blizzard down on the opponent to your left, while seven will singe the opponent on your right with a number 7 Fireball, each deals one damage. And finally, Eight number 8 Magic Drinks there are to heal you a bit; retrieve one life token. You’ll need those Magic Drinks: spell casting is dangerous business. The 8 different spell types in Abracada…what? You see, the catch is, while you know what spells are on the stones, and exactly how many there are of each type, you can’t see what spells are on the stones in front of you – which happen to be the only ones you can cast successfully. On your turn, if you cast a spell – “Abracada…” – and it’s not one of the stone’s in front of you, you’ll be saying “What?” as the spell fizzles and costs you a life point – or more if you flubbed summoning the Ancient Dragon – thus ending your turn. If the spell you cast is on one of the stones in front of you, it goes off without a hitch and you resolve the effect. 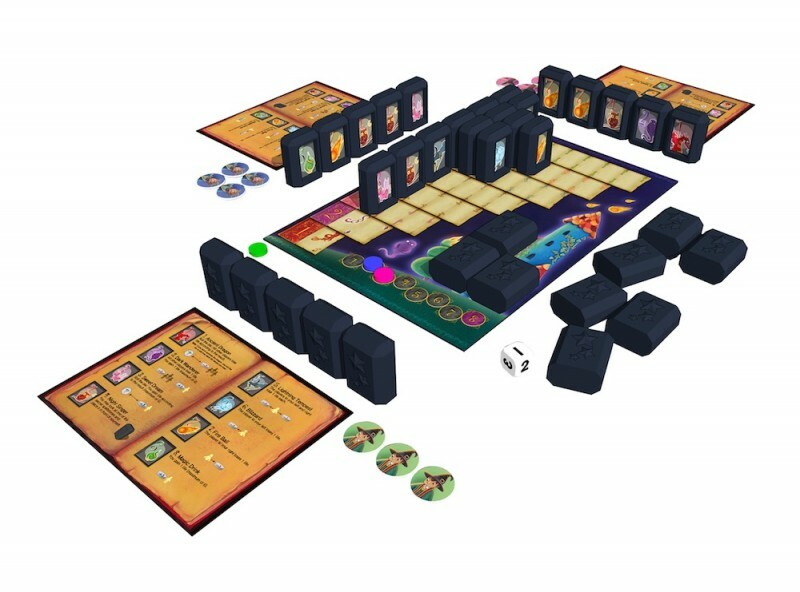 The player on your right, takes the matching stone from in front of you (only one if there’s more than one stone with the same spell), and places it on the board, so everyone can see which spells have already been cast. You can then, if you wish, try to cast another spell, but only one of equal or higher value. For example, if you successfully cast Blizzard (6), you can try casting another Blizzard (6) or a Fireball (7) or a Magic Drink (8). However, if you accidentally follow up your Blizzard (6) with a Sweet Dream (3) and one of your fellow wizards calls you on it, you lose a life token. You can keep casting spells – as long as you’re successful – until you choose to stop or run out of spells to cast. If you succeed in casting all the spells in front of you during your turn or you take out one of your opponents by causing him to lose his last life token, you win the round. Otherwise, you draw back up to 5 stones and play passes to the next magician. Should you take yourself out by flubbing a spell and losing your last life token, that also ends the round. All survivors, regardless of how the round ended, score 1 point, plus 1 bonus point for each Secret Stone they acquired that round with a Night Singer (4) spell. To win the wizardly war, you need to earn 8 points. To prepare for the next round (and to set up the first round), place all the spellstones face down on the table and mix them together. Set four aside as Secret Stones (facedown), then deal five to each player. Leave the rest in the middle of the table to form a draw pile. Set your stones up in front of you, but facing away towards the center of the table so that your fellow players can see them, but you cannot. If you accidentally see one of your stones, mix it into the draw pile and take another. Play then continues with the next player. Each game consists of several rounds. You can improve your chances of casting spells successfully by paying attention to the spellstones in front of your fellow players, as well as those on the board that have already been cast. For example, you know there’s only one Ancient Dragon (1) spell, so if it’s in front of Tim, you don’t have it, so don’t try to cast it. You should also pay attention to which spells the other players are not casting. Chances are it’s because those spellstones are in front of you! Abracada…what? is a light, family game, perfect for both kids and adults. The illustrations, by Marie Cardouat, are cute and colorful. Marie Cardouat is the same artist that illustrated the original Dixit games. 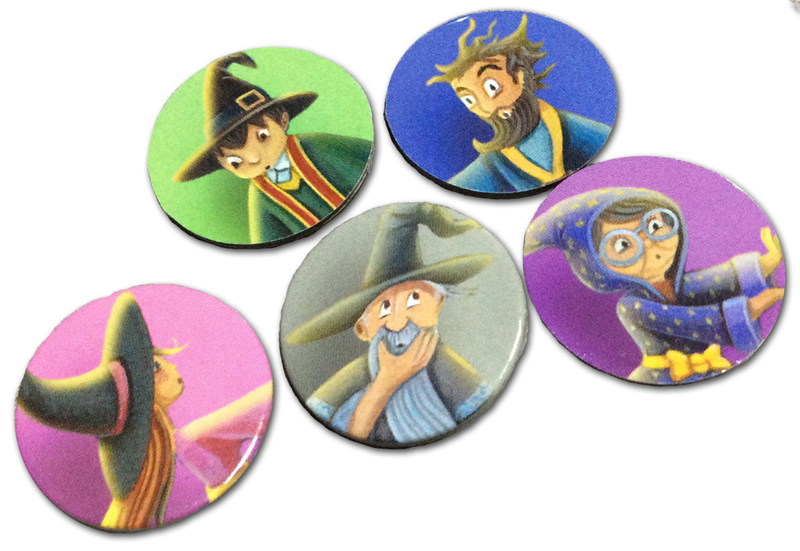 The game includes 6 life tokens for each player, each set depicts a different wizard and, I’m happy to say, there are both guys and gal wizards. There’s also a handy spell reference on heavy cardstock for each player. 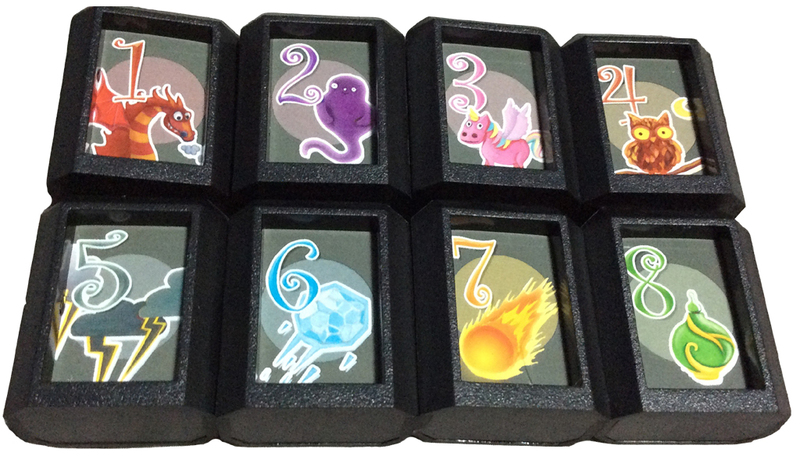 The spellstones are made of a sturdy black plastic. Each has a slot into which you’ll insert one spell card (made of cardboard). It takes about ten minutes to punch the spell cards and player tokens and insert the spell cards into the stones before your first play. Take care to insert the artwork right side up, otherwise it’ll appear you have numbers you shouldn’t have! You’ll also want to mix the stones gently. If you move them too vigorously, the spell cards tend to slip out a bit. Otherwise, the components are pretty sturdy. His breath burns hot, so grab some ice. To burn my fellows, but please not me! I’m sure you can do better. I tried doing sound effects when I played, but my fellow players didn’t reciprocate, they just said the spell name and number. Party poopers. Abracada…what? has already earned several honors, including: 2014 Golden Geek Best Children’s Board Game Nominee, 2014 Meeples’ Choice Nominee, and 2015 Spiel des Jahres Recommended. It supports 2 to 5 players ages 7 and up. I don’t see any reason younger kids who can count couldn’t play. It won’t take them long to memorize what each spell does if they can’t read yet. Playtime is about 30 minutes.